Derek is pleased to have Rich Tommaso back on The Comics Alternative. He appeared on the show last year to discuss his new series at the time, She Wolf, but this time he talks about Spy Seal, his intriguing new anthropomorphic espionage series from Image Comics. They begin by chronicling the genesis of the story, a comic that Rich began as a thirteen-year-old, and then discuss the development of the premise and the various choices Rich made in situating his narrative. One way that Rich describes his new series is by paying homage to Hergé’s Tintin, the globetrotting young investigator who always found himself immersed in adventure and intrigue. He also discloses many of the lessons he learned with his previous Image series, both She Wolf and Dark Corridors, his love of genre, and his need to move on — at least momentarily — from psychological horror and crime stories. Derek also asks Rich about his plans for future Spy Seal narrative arcs, the temporal settings of these plots, and the ways in which the uncertainty of creator-0wned series impacts a writer’s storytelling choices. 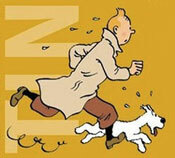 Perhaps the most famous comic to come out of Europe is The Adventures of Tintin, by the Belgian known as Hergé. It’s known the world over and has appeared in more than 80 languages. Tim and Kumar discuss the comic’s appeal, Hergé’s expert cartooning, and some of the controversies that have swirled around the strip and its creator. Also, Kumar has some observations about the trailer for the upcoming Tintin movie.